Picture - Antonov An-74T at Hostomel Airport, Ukraine. The Antonov An-72 (NATO reporting name 'Coaler') is a transport aircraft developed by Antonov in the former Soviet Union. It was designed as a STOL transport and intended as a replacement for the Antonov An-26, but variants have found success as commercial freighters. The An-72 gets its nickname, Cheburashka, from the large engine intake ducts, which resemble the oversized ears of the popular Soviet animated creature with the same name. The An-72 first flew on 22 December 1977. Produced in tandem with the An-72, the An-74 variant adds the ability to operate in harsh weather conditions in polar regions, because it can be fitted with wheel-skis landing gear, de-icing equipment, and a number of other upgrades allowing the aircraft to support operations in Arctic or Antarctic environments. 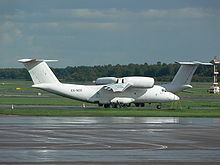 Other An-72 versions include the An-72S VIP transport and An-72P maritime patrol aircraft. An unusual design feature of the An-72 and An-74 is the use of the Coandă effect to improve STOL performance, utilizing engine exhaust gases blown over the wing's upper surface to boost lift. The first flight was made in August 31, 1977, but it was only in the 1980s that production started. The power plant used is the Lotarev D-36 turbofan engine. 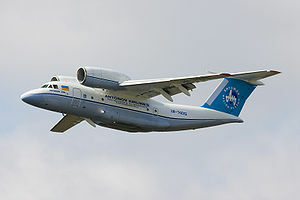 The An-72 bears a resemblance to the Boeing YC-14, a prototype design from the early 1970s which had also used overwing engines and the Coandă effect. The rear fuselage of the airplane has a hinged loading ramp with a rear fairing that slides backwards and up to clear the opening. Up to 7.5 tons can be airdropped whilst there are folding side seats for 52 passengers. The An-72 has extremely good short field capabilities. Like many other Soviet-built aircraft, this jet plane was designed to operate on rugged airfields, its powerful undercarriage dealing well with sand, grass or other unpaved surfaces. In January 1997 and 1998 the Paris-Dakar rally was assisted by two An-72 aircraft. In 1999 a total of four planes of this type joined the rally. The price for a new built An-74 in 2006 is quoted as being $17-20 million. Three prototypes of the An-71 AEW aircraft were built and tested but were rejected in favour of the Yak-44. The An-71 had a rotodome supported on top of a swept forward fin and operators stations for six as well as mission electronics in the cargo hold. There are some reports that the aircraft was fitted with an RD-38A Lift-fan to improve the STOL performance, but this is unconfirmed by reliable sources. An-72 'Coaler-A' - Pre production aircraft. Two flying prototypes, one static test airframe and 8 pre-production machines. An-72A 'Coaler-C' - Initial production STOL transport with a longer fuselage and increased wing span. An-72AT - 'Coaler-C' - Freight version of the An-72A compatible with standard international shipping containers. An-72S - 'Coaler-C' - Executive VIP transport fitted with a galley in a front cabin, work and rest areas in a central cabin, and 24 armchairs in a rear cabin, can also be reconfigured for transporting freight or 38 passengers or as an air ambulance carrying eight stretchers. An-74 - Arctic/Antarctic support model with room for five crew, increased fuel capacity, larger radar in bulged nose radome, improved navigation equipment, better de-icing equipment, and can be fitted with Wheel-skis landing gear. An-74A - Passenger or freighter model. An-74MP - Marine Patrol version. Can transport 44 soldiers, 22 para-troops, 16 stretchers with medical staff, or 10 tonnes of cargo. An-72P - Patrol aircraft. Armed with one 23 mm GSh-23L cannon plus bombs and/or rockets. An-74T - Freighter version equipped with an internal winch, roller equipment, and cargo mooring points, can also be fitted with static lines for paratroops or dropping air cargo. An-74T-100 - Variant of the An-74T fitted with a navigator station. An-74TK - Convertible passenger/cargo model that can be equipped for up to 52 passengers, all cargo, or a mix of the two. An-74TK-100 - Variant of the An-74TK fitted with a navigator station. An-74TK-300 - Upgraded model primarily for civil customers with more fuel efficient engines in a conventional underwing position, lacks the STOL capabilities of earlier models but is less expensive to operate. An-74TK-300D - An An-74 with engines fitted underneath the wings. An-74-400 - Proposed stretch model of the An-74TK-300 with a fuselage insert to extend length by 26 ft (8 m), also would be equipped with uprated engines.